One of Rick Wershe’s tormentors has passed from the scene. Gil Hill pulled a lot of strings to keep Wershe in prison. It worked. He’s still in prison 28 years after his conviction. Hill got even in a devastating way because Wershe helped the FBI investigate corruption in the Detroit Police Department. Hill was among the targets based on Wershe’s information. Not only did he get even—he got away with it. They buried Gil Hill yesterday. He died early last week from pneumonia brought on by COPD—Chronic Obstructive Pulmonary Disease. He was 84. The newspaper obituaries recalled his high-profile police career, including his stint as the head of the Detroit Police Homicide Section. They noted his minor movie star status from supporting roles as actor Eddie Murphy’s police boss in the Beverly Hills Cop movies. The newspapers wrote about his second career in politics; how he won election to the Detroit City Council, going on to become Council President. They described him as a friend of the city. The obits cited his failed campaign to become mayor. He lost to Kwame Kilpatrick, who was convicted while in office, twice, and who is still serving time in a federal prison. The Detroit papers—the Free Press and the News—did NOT mention in their obits that Hill had been under FBI suspicion for potential criminal prosecution for official corruption in drug trafficking investigations—twice. The first case involved possible charges of obstructing justice in the murder of 13-year old Damion Lucas in 1985. The young Detroit boy had been killed by mistake by associates of large-scale drug dealer Johnny Curry. Curry’s cronies shot up the home where the young boy was living as a message to the boy’s uncle who owed the Curry gang for drugs they had fronted to him. The drugs had been confiscated in a police raid and the uncle, Leon Lucas, was on the hook to the Currys for the cost of the drugs. He said he didn’t have the money to pay the Currys. Three members of the Curry gang shot up the Lucas house as a warning. Leon Lucas wasn’t home but his nephews were. The oldest, Damion Lucas, caught a machine gun slug in the chest and died in the arms of his terrified younger brother, Frankie. Rick Wershe, Jr., who was working secretly as an FBI informant in the Curry investigation, told agent Herman Groman, now retired, that he, Wershe, was present when Johnny Curry had a speakerphone conversation with Gil Hill who assured Curry he didn’t have to worry about the homicide investigation. Wershe says he heard Gil Hill assure Curry that he, Hill, would take care of it. Indeed, he did. 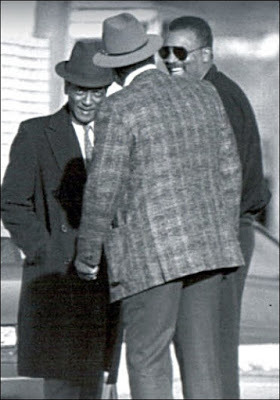 Homicide investigators working under Gil Hill never interrogated Johnny Curry or any of his associates even though the dead boy's uncle told them he believed the Currys were responsible. Instead the homicide detectives who worked for Gil Hill pursued an innocent man for the murder of Damion Lucas. Those charges were eventually dropped. The Currys were never investigated. No one has ever been prosecuted for the Damion Lucas murder. After Johnny Curry went to prison for drug trafficking he told two FBI agents he paid Gil Hill $10,000 to keep the investigation away from him and his drug organization. 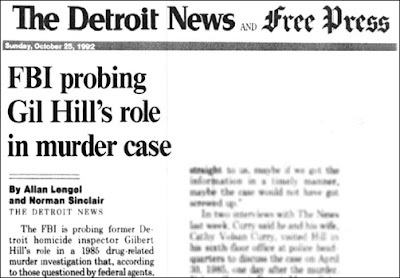 Curry said the bribe was paid in Hill’s fifth-floor office in the Homicide section of the Detroit Police Department. Hill denied it to reporters. 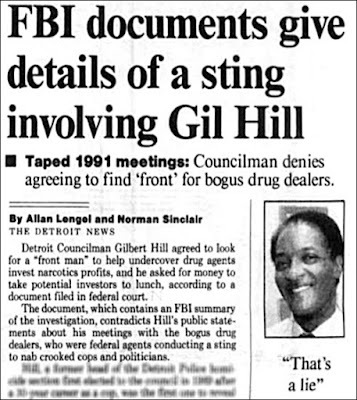 Readers who saw Gil Hill's obit articles in Detroit's two major newspapers last week were not told that he was investigated twice by the FBI for suspected drug-related corruption payoffs. There was no mention of articles like this in 1992. Newcomers to Detroit were not told about the other side of Gil Hill. The FBI did not accumulate enough evidence to charge Hill for obstructing the investigation of the murder of Damion Lucas. But the case stuck in the craw of FBI agent Groman. 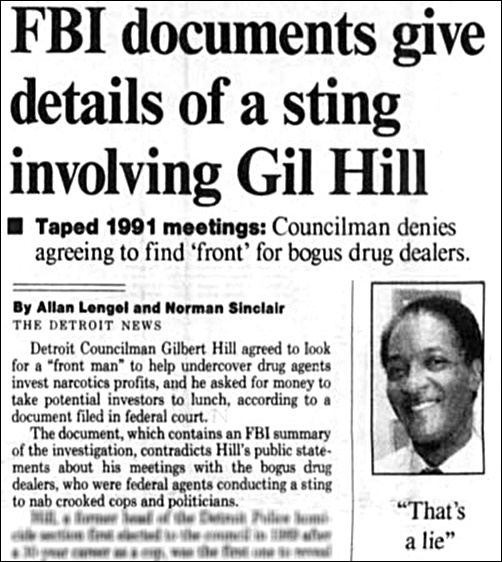 When he was transferred from the Detroit FBI’s drug squad to the public corruption squad, the suspected criminality of Gil Hill was prominent on his radar screen. In time Groman, along with agents Marty Torgler, Michael Castro and their squad mates devised a plan for an undercover sting operation to find which Detroit police officers might be susceptible to accepting bribes to protect what the cops thought were dope and drug cash shipments transiting through the city. By now Rick Wershe was in prison, serving a life sentence for a questionable conviction for possession of 17 pounds of cocaine. The Detroit FBI and the Detroit U.S. Attorney, to their enduring shame, did not lift a finger to help Wershe by stepping forward to say Wershe got in the dope business in the first place after helping the FBI as an undercover operative. To do so would require that they publicly admit they had recruited a 14-year old to help them wage the so-called War on Drugs. In a bout of group cowardice, federal law enforcement in Detroit failed to stand up for one of their best confidential informants and allowed him to be doomed to a life in prison. To their credit several FBI agents who worked with Wershe back then have since expressed willingness to testify in his behalf regarding parole. Over the years and to this day the leadership of the Detroit FBI and U.S. Attorney’s Office has been steadfast in a craven refusal to help a man who helped them score major prosecution victories. In the early 1990s when the Detroit FBI was planning their undercover sting operation to snag cops willing to be corrupted by drug cash, they approached Rick Wershe—in prison—and asked him to help set up the undercover sting operation by vouching for an undercover FBI agent as one of his former Miami “connects” in the dope trade. Wershe was asked to contact Cathy Volsan Curry, the mayor’s niece, to help the undercover agent make the necessary contacts. Wershe and Volsan Curry had had a brief, torrid fling and Wershe knew she had “contacts.”He agreed to help. Wershe reached out to Volsan Curry and it worked. She consulted with her father, Willie Volsan, a longtime black gangster and dope dealer in Detroit. Before long, a dozen or so police officers were in on the scheme to provide police protection for supposed drugs and cash being flown in to Detroit’s City Airport. The private plane was piloted by FBI agents. Volsan, as the mayor’s brother-in-law, was well-connected to the upper ranks of the Detroit Police Department. Among his pals was Gil Hill. At this point, Hill had retired from the police department and he was now a member of the Detroit City Council. Detroit is always starved for heroes and Hill’s status as a former “movie star” aided his rising political popularity. Always the savvy street cop, Hill was suspicious of the sting operation even as he was intrigued by the payoff money to be made. In a manner of speaking Hill circled the scheme like a vulture, evaluating whether it was a set up. There was a meeting at the Detroit FBI office on how to proceed. The evidence against the targeted cops was solid. The debate was over what to do about Gil Hill. it was a toss-up as to whether there was enough evidence to win his conviction from a jury. The case agents argued in favor of indicting Hill. U.S. Attorney Stephen Markman, now a Michigan Supreme Court Justice weighing Wershe’s pending appeal to lower his sentence, also was reportedly in favor of going forward against Hill. Helterhoff hailed from northern Wisconsin and he relished running the Detroit office which allowed him to drive through northern Michigan to upper Wisconsin on many weekends to visit and hang out with his family. He didn’t want to do anything to jeopardize his perch in the Detroit office. A transfer to another field office in another state is the last thing he wanted. If Hill was indicted but acquitted, a transfer for Helterhoff was a distinct possibility. At the meeting Helterhoff insisted the Hill portion of the case needed more evidence. That was the effective end of the Hill portion of the investigation. The agents knew the street-savvy Hill would smell the sting operation and back out. For the second time in 10 years Gil Hill escaped federal indictment for corruption. There’s another element in all of this that no one wants to talk about. Gil Hill was black. Gil Hill was a hero to many in the black community who didn’t know the dark side of his career. To many he was a legendary homicide detective and movie-star. Far fewer knew he was corrupt and only too willing to be bribed to break the law. Even fewer knew how frightened the mighty U.S. Justice Department is when it comes to prosecuting black heroes. It takes an extraordinary set of circumstances for the Hal Helterhoffs of the Justice Department to risk asking a jury to convict a black hero. Federal law enforcement is all too aware of what happened in the O.J. Simpson murder trial. While some “leaders” of the black community complain loudly about FBI persecution of high profile blacks, what isn’t discussed is how often corrupt black politicians facing substantial evidence of criminality escape prosecution because of their iconic public status. 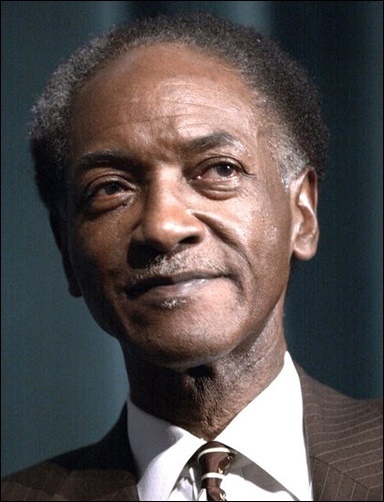 Some say Gil Hill blamed Rick Wershe for thwarting his bid to become mayor of the city of Detroit. If it weren't for Wershe's informant tips, the FBI wouldn't have been after Hill and there wouldn't be those pesky headlines associating him with drug corruption. There is significant evidence that Gil Hill played a lead role in a collaborative scheme to mislead the Michigan Parole Board in 2003 to ensure that Rick Wershe, Jr. remained in prison. The parole board was given false and misleading "evidence" that Wershe was/is a menace to society. That so-called evidence has been spelled out in past blog posts on Informant America. This story was not mentioned in the newspaper obits last week for Gil Hill. In one FBI court-authorized surveillance recording in 1991 Volsan and Hill were in a meeting with undercover agents and the discussion turned to Hill’s political future. He said he wasn’t sure if he should run for re-election to the city council or make a run for mayor. Volsan asked him which office he would run for. Hill expressed concern about subjecting himself to a high profile political campaign. “I got skeletons in my closet,” Hill told Volsan. One of those skeletons belongs to murder victim Damion Lucas who has never had justice. Another skeleton in Hill’s closet is still alive. He’s spending his life in prison for helping the FBI try to root out corrupt cops like Gil Hill. Detroit’s black political machine has worked for years to nurture and sustain a vendetta to keep his living skeleton behind bars, and it has succeeded. His name is Richard J. Wershe, Jr.